A new book celebrates the intricate illustrations of the Mewar Ramayana, one of the oldest surviving manuscripts of the famous text. Enclosed within a yellow and red frame, measuring 19 x 35 cm, Sahibdin paints what author JP Losty describes as “among the most beautiful creations of 17th century Rajput art”. In the scene from the epic Ramayana, Ram, Sita and Lakshman are seen leading a tranquil life in the serene surroundings of Chitrakoot, where the artist paints their leaves and reed hut against purple rocks and lavishly coloured trees. The intricacy is evident, as is the skill of the master artist Sahibdin, who has been celebrated as one of the more dominant painters of the Mewar School in the 17th century. The illustration is one of the hundreds that he composed for his patron Rana Jagat Singh in the 1640s. It is also among the several compositions of what now comprises, arguably, the finest illustrations of the Ramayana commissioned by a Hindu ruler and is referred to as the Mewar Ramayana. “The Sisodia Rajputs of Mewar claimed descent from the Sun and numbered among their ancestors Ram himself, so Jagat Singh commissioned this immense manuscript as a kind of family history of his ancestors, rather similar to the ancestor-glorifying illustrated histories of the Mughal emperors of India with which he and his father Karan Singh would have been familiar from their visits to the Mughal Courts,” notes Losty, former curator of the extensive Indian visual collections in the British Library. While he points out that unlike most other Hindu illustrated manuscripts of the era — which were broken up, dispersed and thereby lost — this one has survived, almost, (though scattered), he has also given it another life in the form of the publication Ramayana (Roli Books), where he and co-author Sumedha V Ojha narrate the epic, close to the format of Singh’s Ramayana, juxtaposing Sahibdin’s imposing paintings with text that gives details of the various episodes of the Ramayana. The selection of the republished paintings celebrate the narrative illustration. Having first stumbled upon some of the volumes of the Mewar Ramayana in the collection of the British Museum in the early ’70s, Losty points out that even before Sahibdin embarked on this project he was a master artist, with his rendition of the Ragamala, followed by Gita Govinda and Rasikapriya. “These smaller sets had been preliminaries in which his artists worked out how to reduce Hindu classic texts to the two dimensions of the picture plane,” notes Losty. The Ramayana, though, was bigger in scale, with each painting occupying a whole page, followed by the sacred text in the horizontal format of the pothi. “The only way Sahibdin could include every episode of interest in the text is by reverting to the convention of simultaneous narration, as found in ancient Buddhist sculptures and also on the painted walls of the Ajanta caves. The same characters appear several times within a single painting to indicate either spatial or temporal progression in the story,” adds Losty. 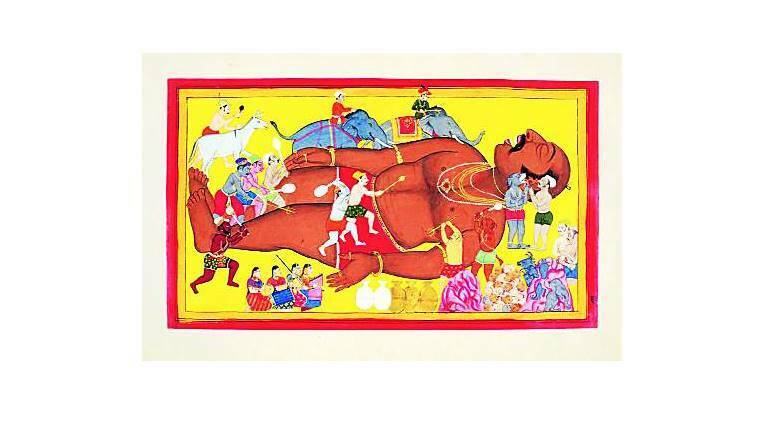 Divided into the various episodes from the Ramayana, including the Bal Kanda, Ayodhya Kanda, Sundar Kanda and Uttara Kanda among others, in Losty and Ojha’s work, too, the text accompanies the illustrations. While Ojha pens the story of the epic, Losty gives detailed analysis of the brushwork, helping in its readings. He discusses not just the style of the master Sahibdin but also other artists of the court who contributed to the Mewar Ramayana. Pointing to a painting that depicts the scene when Ram is informed of Dashratha’s death, for instance, Losty notes that Sahibdin “overrules the author for the sake of greater expressiveness. He disregards the correct order of procession for Hindu funeral rites as given in Valmiki’s text (females youngest to eldest, then males likewise, ie, Seeta, Lakshman, Ram) so that he can depict Bharat and Shatrughn supporting their eldest brother on their way down to the river, followed by Lakshman and Seeta.” He “faithfully interprets Valmiki” in the Yuddha Kanda. While the British Library has digitised the illustrated manuscripts of the set that it partly owns, with some of its volumes presented by Maharana Bhim Singh of Mewar to Captain James Tod who took them to Britain in 1823, the recent publication not just retells the epic Ramayana but more importantly depicts the heavily illustrated and the oldest surviving manuscript. 3 Amitav Ghosh to get Lifetime Achievement Award 2016, in Tata Literature Live!